Our SDC Verification solution eliminates silicon failure resulting from incorrect constraints. It eliminates the need for gate-level simulation – an incomplete, time-consuming and late-in-the-day approach to catching constraint bugs. By using a proprietary formal engine that was developed specifically for constraint verification we do not inundate designers with noise. Subtle issues are flagged by our Confirm product that goes the extra mile to establish constraint correctness. What cannot be proven formally is converted into a System Verilog Assertion. 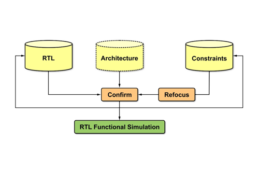 The SVA generated by Confirm is integrated into an RTL simulation environment to establish constraint correctness while reusing your existing regressions. 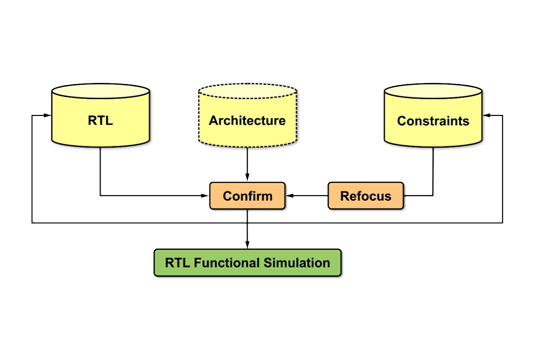 Confirm does not synthesize RTL to gates and so its integration with an RTL simulator is seamless – the SVA generated by Confirm is compact and unimpacted by logic-cone complexity because we can refer to any of the RTL nets on a design. Refocus allows us to map gate-level constraints to RTL allowing SDC signoff using RTL. FishTail’s formal + ABV SDC verification methodology ensures that designers are reviewing real constraint issues. The low review effort required when using FishTail’s SDC Verification solution allows it to be deployed broadly within an organization. FishTail’s SDC Verification flow reads the RTL description for a design along with either gate or RTL level Tcl constraints. Refocus maps the constraints to the design, flagging syntax and constraint application issues. The constraint are formally proven using Confirm and issues are presented to an engineer for review using a powerful debug environment. Constraints that fail formal proof are converted into assertions generated by Confirm and integrated into RTL simulation. We had drama due to missing constraints and multicycle exceptions that ended up causing silicon issues. Fishtail was the best tool to close those disconnects in our flow. Worked very well with multicycle exceptions checking and found one that the designer kept arguing was okay but finally realized it was not. Kudos to the Fishtail tool for finding this bug before we taped out. Their Refocus tool is also very useful. We also found the verification assertions generated by Refocus well thought through and saved designers time in reviewing violations till verification shows a clear issue. I estimate it'll reduce months in the schedule for timing exceptions to probably no more than 2 weeks. FishTail found errors in few of our user-specified MCPs, all of which were removed from our final constraint file. We just taped out this chip and our experience with the FishTail tools has been very positive. I have been watching and evaluating FishTail for some time. I am VERY impressed with this technology and with this company. They are very bright folks and they are dedicated to the success of their customers. They have taken a very difficult problem and provided a pragmatic solution. Anyone using timing exceptions and not using FishTail is playing with fire. We use it in our flow and have found Fishtail's Focus tool is well worth the money. In our last tapeout, it caught 6 user defined exceptions which were wrongly declared, hence probably saving us a chip revision.